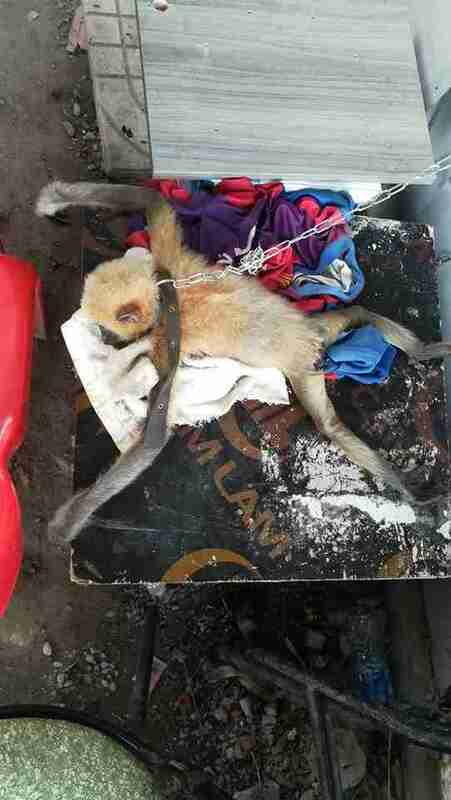 A tourist traveling through Vietnam recently spotted a baby gibbon in a parking lot — he was shackled by his neck and hunched over a small cage. What compounded the sadness of the image is just how common such a sight is. One of the major threats facing yellow-cheeked gibbons is the illegal pet trade — and this baby was a victim of this rampant network, like so many others. Now one knows exactly how long this baby ape had been living like this, or how he came to be chained up there in the first place. But he was obviously very weak and sick. The tourist decided to take action — he contacted an organization called Education for Nature - Vietnam (ENV), which aims to help animals and the environment in the region. "The case was reported to ENV’s Wildlife Crime Unit," Doug Hendrie, director of the ENV Wildlife Crime Unit, told The Dodo. 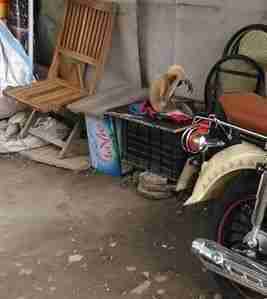 "The informant stated that he observed a juvenile yellow-cheeked gibbon being kept by a security guard in a parking lot in Ben Nghe Ward of District 1 in Ho Chi Minh City." Specialized environmental police were then dispatched to save the little animal. Once the officers arrived, they informed the security guard that it was actually illegal to keep an animal like this — and the man had had no idea. "The security guard was given a warning by police," Hendrie said. "Police felt that he was unaware of the law protecting the species." 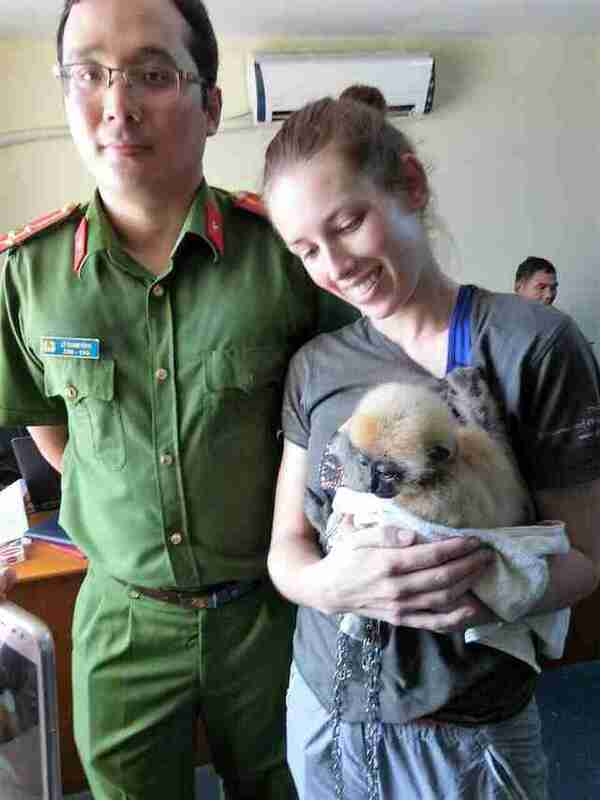 Now, a few weeks after his rescue in late June, the little gibbon is already looking in better spirits. 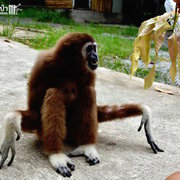 He was transferred to the Dao Tien Rescue Center in Cat Tien National Park where he's being raised by wildlife experts. 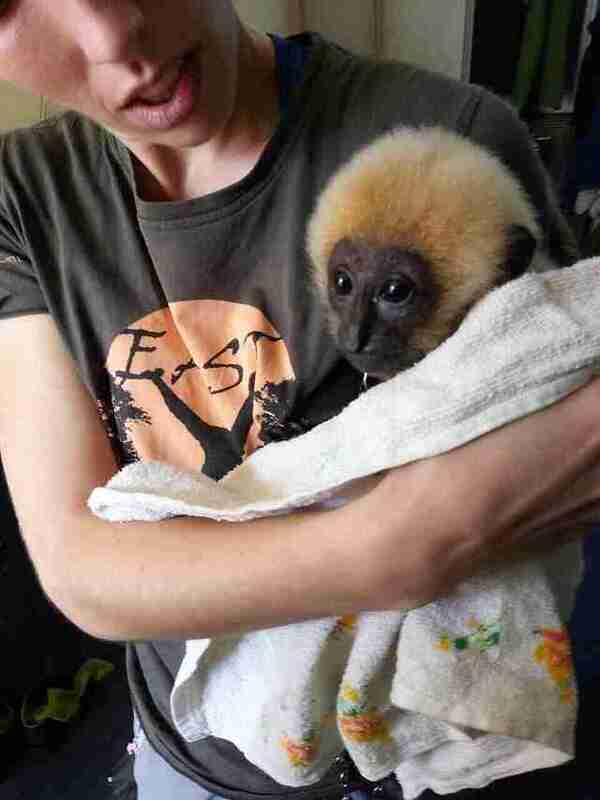 "The baby gibbon rescued from the parking lot is doing well and looking healthier already at its new rescue center home!" ENV wrote on Facebook. "Good job, everyone." You can help animals like this gibbon escape desperate conditions by making a donation to ENV.